Starring: Melissa McCarthy, Richard E. Grant, Dolly Wells, Ben Falcone, Gregory Korostishevsky, Jane Curtin and Stephen Spinella. “Full of well-earned laughter and hard-won wisdom, it’s as smart and mature as any movie in contention for Oscars this season. “The title of the film (and of Israel’s 2008 memoir) is a phrase Israel wrote in a forged letter supposedly by Dorothy Parker, apologizing for drunken misbehavior. But Israel was proud of her forgery career, which she turned to in the 1980s after her celebrity biographies stopped selling and she wound up on welfare by age 50. The film follows her as she goes from begging her agent Marjorie (Curtin, 71) for an advance to forging some 400 letters by Parker, Noel Coward, Lillian Hellman and others before the FBI arrests her. “But her movies for the most part since Bridesmaids have been terrible, including The Boss, The Heat, Identity Thief, Tammy, Spy, Life of the Party, and The Happytime Murders. That she is the best thing in these movies isn’t saying much. Like Eddie Murphy, another potentially great actor who perpetually underuses his gifts, or, I fear, Tiffany Haddish, who in the space of little more than a year is already piling up a roster of stinkers undeserving of her brilliance, McCarthy can be her own worst enemy in her choice of material. “The pivot of the action is Lee’s unwillingness to expose her own life and character to the scrutiny and criticism of readers, and the gap that her inhibition—one born of her fortress of privacy—makes between her artistic soul and her artistic voice. Starring: Michael Caine, Christopher Reeve, Dyan Cannon, Irene Worth, Henry Jones, Joe Silver and Tony DiBenedetto. Starring: Patrick Fugit, Billy Crudup, Kate Hudson, Frances McDormand, Jason Lee, Zooey Deschanel and Philip Seymour Hoffman. “Coming as it does on the heels of the most intensely raunchy and witless summer in Hollywood history — a season Variety editor Peter Bart feared might ‘kill the art of movie comedy forever’ — the timing of Crowe’s Almost Famous could hardly be better. “It’s not only the most gentle and effortlessly funny movie so far this year, it’s a film with a style and sensibility that wonderfully harkens back to Hollywood’s golden age of sophisticated comedy, and in particular to the masterpieces of Crowe’s filmmaking idol, Billy Wilder. Can You Ever Forgive Me? opens at The Grand Cinema on Friday, Nov. 2. Deathtrap will screen at 7:15 p.m. on Friday, Nov. 2 in the Center for Spiritual Living (206 N. J St). Almost Famous will screen at 7:15 p.m. on Friday, Nov. 9 in the CSL. The TFC Discussion Night for these three films is Wednesday, Nov. 14 in the CSL. All three films handle the subject of notoriety in pointed ways: egos are placated, illusions craftily manifested. Reflective of the cultures these films are immersed in (rock and roll, Broadway, literary archives), the writers seek to give their audiences exactly what they want. And therein lies the problem. Within these cultures, reputations are at stake, unwritten codes are honored and authenticity is an elusive premium. The piercing mental toll this takes on protagonists William, Lee and Sydney tightens their intellectual leverage against outside forces of conflicting persuasion (the press and the law) yet ultimately unravels each character. 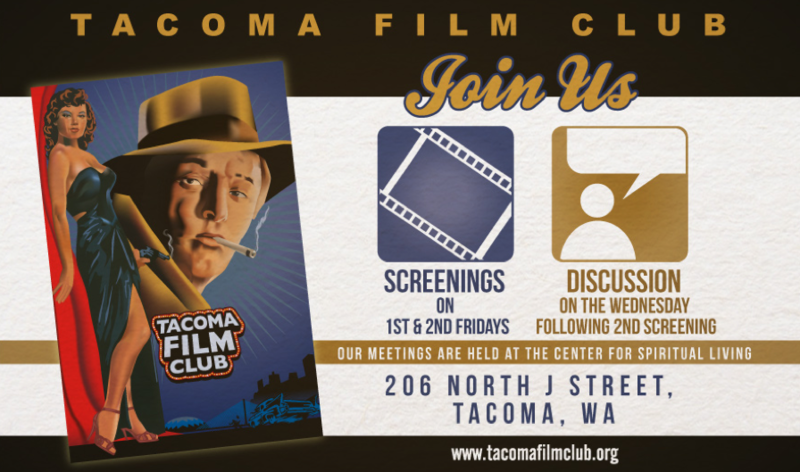 Come join us tonight (Nov. 14, 7 p.m., 206 North J Street, Tacoma, WA) to discuss these films and support our own little local cinéaste culture.